The term op-amp or operational amplifier is a one sort of integrated circuits. In 1963, the first operational amplifier is invented by Fairchild Semiconductors. Op-Amp is the basic building block of analog circuits that completes a various kinds of analog signal processing tasks.The function of the op-amp can be controlled by using an external feedback and these ICs are used as a versatile device in several electronic instruments. Op-Amp comprises of two i/ps and two o/ps such as inverting amplifier and non inverting amplifier. The applications of this IC mainly involve in various electrical and electronic kits, filters, oscillators, pulse generators, comparators, etc. The main function of the op-amp is to increase the ability of AC and DC signals and also used for mathematical operations. This article gives an overview of what is inverting operational amplifier and non-inverting operational amplifier, the differences between the inverting and non- inverting terminals. Follow the below link to know more about: Op-Amp circuits and basics with applications. In a non-inverting operational amplifier, pin3 is an input pin whereas pin6 is output pin. Whenever the voltage is applied to pin3 then the output comes from the pin6. If the polarity of the input pin is positive, then the output polarity which comes from the pin6 is also positive. So the output is not opposite to input. The circuit diagram of the non-inverting operational amplifier is shown above and non inverting amplifier gain is generally calculated by using the following formula. From the below Vin and Vout equations, the voltage gain of the closed-loop non-inverting amplifier can be calculated by using the following equations. The voltage gain equation in the above is positive, signifying that the o/p will be in phase with the i/p signal applied. The ratio of the two resistors used in the circuit R1 and R2 is called voltage gain of the non inverting amplifier. 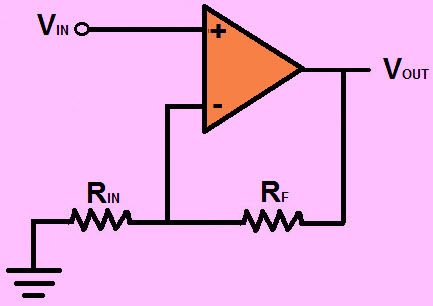 Example circuit of the non inverting amplifier is shown below. Calculate gain of the amplifier (ACL), o/p voltage (Vo), Load resistor current (RL) and the o/p current (Io). The potential of non inverting terminal B is the input voltage and due to virtual short. The applications of the non-inverting amplifier mainly involves in where a high i/p impedance is necessary. Non-inverting and Inverting terminals of the operational amplifiers are two outlines that op-amps can be set up in. The main difference between these two amplifiers are that the most out of an inverting amplifier produces 180o out of phase with the i/p, whereas a non inverting amplifier produces an o/p which is in phase with the input. 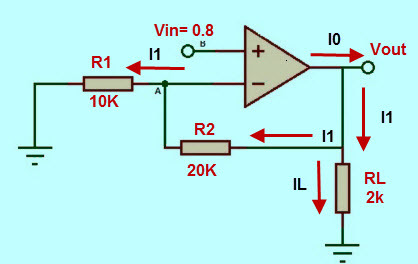 The output of an inverter amplifier is inverted whereas the output of the non inverting amplifier gives which is in phase with the input signal. The gain of the inverting op-amp is used in a negative feedback, is related to the ratio of the i/p resistor or feedback resistor. The gain of the non-inverting op-amp is also relative to the inverting ratio but with an interrupt value. 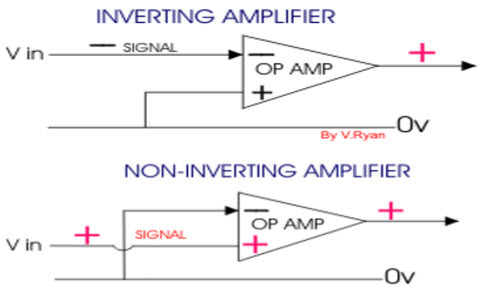 Therefore, this is all about Non Inverting Amplifier tutorial which includes what is operational amplifier, differences between inverting and Non Inverting Amplifiers. Furthermore, any doubts regarding this concept or inverting amplifier calculator, please give your feedback or suggestions by commenting in the comment section below. Here is a question for you. What are the applications of IC 741 op amp? Wow, awesome blog format! How lengthy have you been running a blog for? you made running a blog look easy. The entire look of your web site is magnificent, as neatly as the content material! Great write-up, Iˇm regular visitor of oneˇs blog, maintain up the nice operate, and It is going to be a regular visitor for a lengthy time. Fantastic website. Plenty of useful info here. Iˇm sending it to a few pals ans also sharing in delicious. And of course, thanks to your sweat! hello there and thank you for your info ?I have certainly picked up something new from right here. I did however expertise several technical points using this site, since I experienced to reload the site lots of times previous to I could get it to load properly. I had been wondering if your hosting is OK? Not that I’m complaining, but slow loading instances times will often affect your placement in google and could damage your high-quality score if advertising and marketing with Adwords. Anyway I adding this RSS to my e-mail and can look out for much more of your respective exciting content. Make sure you update this again very soon..